Men's Rogaine® Extra Strength is for men who have a general thinning of hair on the top of the scalp (vertex only, as shown on the package). Not intended for frontal baldness or a receding hairline. 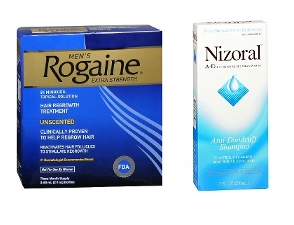 Men's Rogaine® Extra Strength has been shown to regrow hair in men with the degrees of thinning hair or hair loss as shown on the side of the package (see box for details). If men have more hair loss than shown on package examples, Men's Rogaine® Extra Strength may not work. Use to regrow hair on the top of the scalp (vertex only, see pictures on side of carton). your degree of hair loss is different than that shown on the side of this carton or your hair loss is on the front of the scalp. 5% topical solution is not intended for frontal baldness or receding hairline. you are under 18 years of age . Do not use on babies and children. the amount of hair growth is different for each person. This product will not work for all men.